Hey Guys, I have issues with the Performance in Games, mostly i can reach 30 to 50 FPS in the most new games on high graphic Settings in 1080p. I have The Ryzen 5 1600x 3,8Ghz on the MSI B350 Gaming Plus Board with the RX Vega 64 Red Devil Card. with this setup i should be able to play well on 4K. Anyone knows what is gone wrong? I have the latest Driver and Windows 10 Pro. Specifically which games? Not all of them are the same, and some cannot hit 60fps at 4K max details even with a GTX 1080Ti. Sure, but my plan is not to play in 4k, all what i want is to hit my min 60 fps on max Details in 2560x1080p. For example Assassins Creed Origins im dropping to 35 fps in cities or even villages. Conan Exiles im droppping to 35 to 40 fps too. Rise of the Tomb Raider the same. And all of this games i dont even tested it in ultra, only high details and 2560x1080. And couldnt get get stable 60 frames. For a while is some situations yes, but if something start to happen, i dropped to about 35fps. 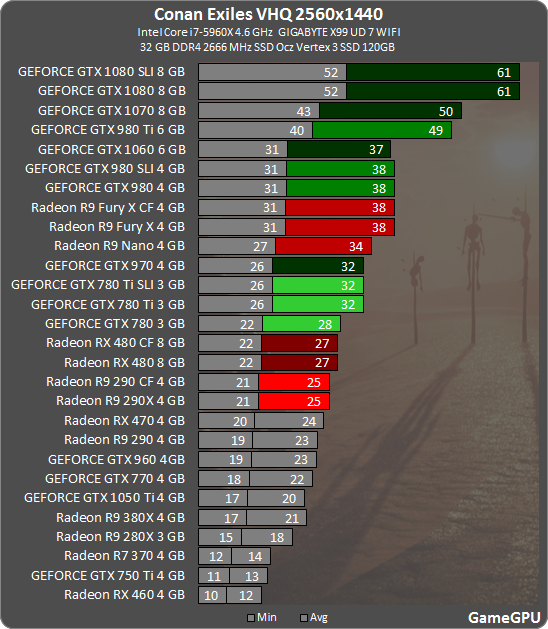 As you can see from the image bearcat22 posted, Assassins Creed Origins is a highly nVidia dependent game, and cannot play at a minimum of 60FPS on AMD hardware even at 1920x1080, and your results are to be expected. As for Rise Of The Tomb Raider, it can also not play at a minumum of 60FPS on any graphics card at 2560x1440, and drops into the 30s like you are experiencing. As for Conan Exiles at the same resolution, as Vega64 is basically the same as the GTX 1080, you're not going to get a minimum of 60fps. So there's nothing wrong, you are getting performance in those games as expected. hmm, ok, i see, its wierd, because i saw on YT Benchmarks with the Card with much higher Framerate, but anyway, the bench you postet are in 1440p, and i mostly cant, get this frames on 1080p. A next example would be Farcry 5 (AMD depended game) which i got together with the card, i saw a bench on 4k with a higher FPS as i have in 1080p (Far Cry 5 | Vega 64 LC 4K Ultra Resolution Scale Gameplay Benchmark | 7700k - YouTube). Im playing this game actually at 35 to 45 FPS on 1080p, but i also see, that the card works only at the half load. And generally i have to say, that i cant see any difference in all games i played yet to the old RX580 i had, ok the price was double so high. Sounds like he's only hitting 30-50 fps at 1080p. Sounds like a gpu driver or heat issue. But yea, need more info. The GPU is running under fullload with 60 to 68°C. Have the latest driver. Installed it twice on a fresh windows. I Mean i installed windows twice and istalled the adrenaline software on the fresh system. And what else could i say. The gpu load in games belong on situation droppes up to 50% in the same time the fps are dropping, but its not because of heat, its more when in the game something more happend. For example if i am in the near of a village or city in assassins creed. And when i leave the city, the fps and the gpu load go up. While the CPU load is stable on 25 to 30%. I didnt have enough Ram. Since i bought more, i have really nice FPS and the Card running on 100% Load too. But, do you know why i cant set VSR on with the DisplayPort cable, it works only with HDMI?